The spacious 2018 Toyota 4Runner can be the SUV that takes you to your next adventure. It’s the perfect vehicle for daily life, but it also provides off-road capability for the weekend adventurers. At Andy Mohr Toyota, we’re proud to offer the 4Runner and everything it brings to the table. When it comes to Toyota 4Runner safety ratings, this off-roading vehicle performs well, with a 2018 4-Star Safety Rating from the NHTSA. Educate yourself about the safety features of the 2018 Toyota 4Runner, and why it’s a great car to drive in Avon, Indianapolis, and Plainfield. When it comes to active safety features, the Toyota 4Runner is prepared—and that’s thanks to the Toyota Star Safety System™, a suite of six active safety features. 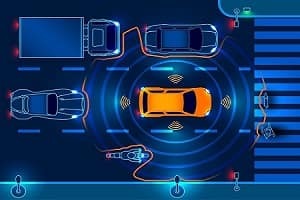 These features keep you, your passengers, and the cars sharing the road a lot safer. Enhanced Vehicle Stability Control: This prevents slippage when understeering occurs or when there’s a strong oversteer when sharply turning a corner. Traction Control: This prevents slipping of the wheels when the gas pedal has been depressed in an excessive manner, particularly when accelerating on slippery pavement or in poor weather conditions. Anti-lock Brake System: This system stops the wheels from locking when the brakes are applied in a forceful manner, or when pressing on the brakes while on a slippery surface. Electronic Brake-force Distribution: With help from the ABS system, brake force will be distributed evenly between the front and rear wheels with this technology. 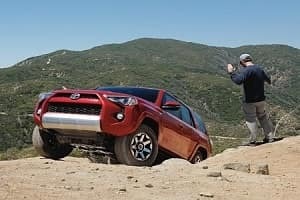 If you’re going to be doing a fair amount of off-roading in the Toyota 4Runner, it’s nice to know you’re backed by a set of passive safety features. This includes the Advanced Airbag System, which features driver and front passenger TAP (Thorax, Abdomen, Pelvis) front seat-mounted side airbags. The Roll-sensing Side Curtain Airbags are an added safety benefit, as well. If the Toyota 4Runner is struck from the side, the side-impact door beams located inside each door can absorb the impact and reduce the chances of another vehicle intruding into the cabin. The standard Tire Pressure Monitor System is another convenient feature, letting you know when the tire pressure may need an adjustment. The available Safety Connect® system keeps you connected 24/7, no matter where you are. The Toyota call center is operated around the clock, so emergency roadside assistance is within reach if help is needed. This also includes the stolen vehicle locator system. The standard integrated backup camera display, meanwhile, comes in handy. Displayed on the touchscreen in the center console, the backup camera lets you know how close the bumpers are from an object or other vehicle. The closer the object, the faster the beeping alert will be. Now that you’ve had the opportunity to read up on the 2018 Toyota 4Runner safety features, come experience this SUV for yourself at Andy Mohr Toyota. We’re proud to offer many 4Runners models on our lot near Avon, Indianapolis, and Plainfield. Schedule a test drive with our sales team today!